I can deal with Greats getting old. When I was a kid Old Greats shilled for coffee makers and lite beer on TV and showed up every so often at the ballpark to wave at the crowd, who roared with tears in their eyes at the Old Greats for their glorious pasts and for continuing to elude the grave. I learned that this is what happened to Greats: They became Old Greats. This prepared me for the subsequent graying and balding and widening and stiffening and bejoweling of Greats from my youth such as Seaver and Bench and Reggie and Schmidt. But when a member of the Cardboard God rank and file suddenly shows up out of nowhere looking old or, worse, dies (as, for example, Ed Brinkman did last week) I feel it a lot more intimately than when I see, for example, that Gaylord Perry has no hair. So if you happen to know what Joel Youngblood looks like these days, don’t tell me. I don’t want to know. To me he’ll always be like he is here, his helmet hiding his premature baldness and preserving his look of glowing youth and vitality. I guess he played for several seasons after this 1980 card, lasting all the way until 1989, but to me he was always one of my two or three favorite Mets during that time in the late 1970s when my affection for the Mets was at its height. As I’ve mentioned before, I always followed the Mets intensely for two weeks every summer during visits from Vermont to see my dad in New York. Dad kept his small black and white television in the one closet of his studio apartment, but he let us take it out to watch Mets games, and for some reason I always associate those viewings, the television propped on a wooden chair, my brother and me sitting on big pillows on the floor, Dad at his desk listening to Bach on headphones, his eyes closed, no interest in the game whatsoever, the three of us about as close as we’d ever be, with Joel Youngblood. 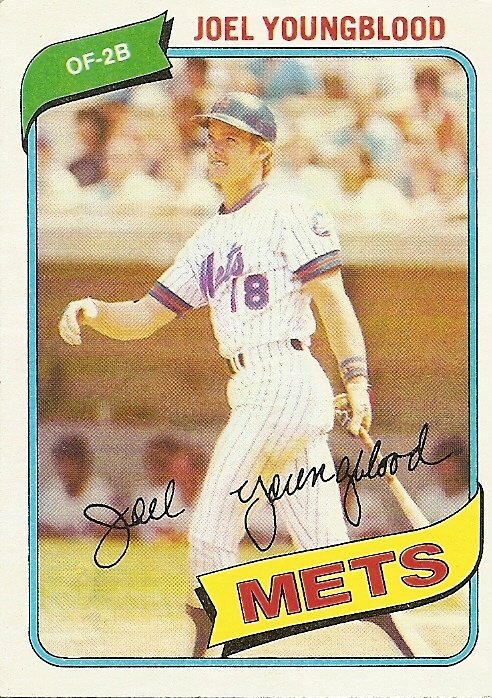 In this card Joel Youngblood wears the number 18, a number which, just a few years later, as it festooned the tight mid-’80s uniform of Youngblood’s number heir, would seem to be targeted for sure retirement by the franchise. If you ever sat in Shea and watched Darryl Strawberry blast a home run off the scoreboard in right field you know what I mean. He seemed to have an invincible talent. But nobody knows what’s going to happen to anybody, and after years of drug addiction and legal problems for Strawberry the number 18 remains officially eligible for further use by the team. You are currently browsing the archives for the Joel Youngblood category.